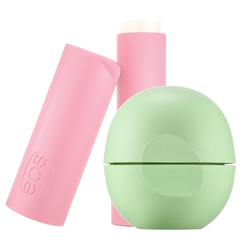 Boost your good vibes with eos Mood Stones Lip Balm. Energy 2-pack features Ruby Citrus & Aquamarine Mint. Mix and match flavors to find your bliss. Aquamarine Mint is inspired by the mysterious Aquamarine aka “The Mermaid Stone,” said to bring good fortune to those on the go, and made with effervescent minty notes to fuel your appetite for adventure. Ruby Citrus is inspired by energizing Ruby aka “The Love Stone,” believed unleash passion and made with luscious strawberry and sweet citrus flavor to light some serious sparks.